Just Ask Jack — Spandex on a Commuter? “Is it OK to wear spandex to work? I usually ride a road bike, but occasionally ride my MTB to work.�? My feeling is to wear whatever you like that makes you comfortable — whether it is spandex jerseys and shorts or tight leather pants and a puffy pirate shirt . Spandex cycling wear wicks moisture and feels pretty comfortable…which is why so many “serious�? cyclists and racers swear by it. 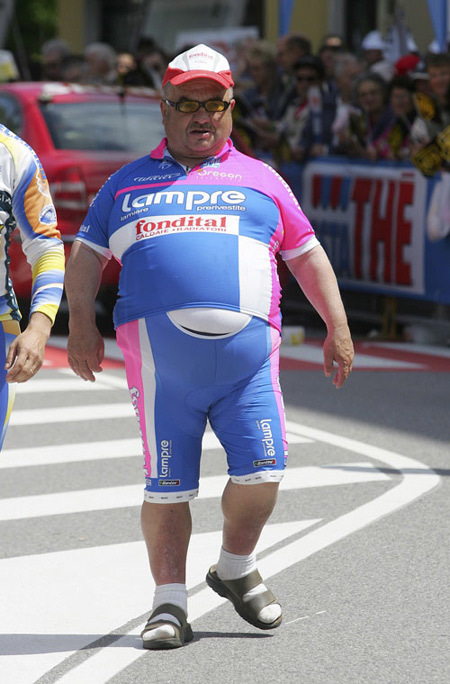 However, there are certain conditions where spandex cycling gear does not fit the bill. First, wearing a full team kit is pretentious, loud and annoying. You should only wear team gear such as Liquigas, CSC or Discovery Channel IF YOU ARE ON THE TEAM! Similarly, wearing a Cervelo jersey while riding a Trek is a big no-no. If we see you, we’ll report you to The Bike Snob. Stick to the brand of bike you own if you absolutely must wear a team jersey and shorts. For everyone else, cycling-specific clothing comes in bright solid colors, too. Another exception is wearing spandex clothing on a one-speed beach cruiser, Kmart special or any bike that even vaguely resembles the bike ridden by the “40 Year Old Virgin“. You’re not fooling anyone into believing that you are some badass fitness freak or serious racer…mostly, you just look overprepared (and a bit silly) to go fast on a bike that is physically incapable of going fast. Seriously, no one should have to look at that!